In nutshell: Battle Royale. Without the blood. The premise is this. Panem’s powerless 12 districts are ruled by the wealthy Capitol, a place where the lucky and the fashionable live charmed lives. So long as they abide by the rules. Under Capitol law, and to forever punish the people of the districts for an historic and failed rebellion, each year a boy and a girl from each district are chosen to take part in the televised Hunger Games, a fight to the death. 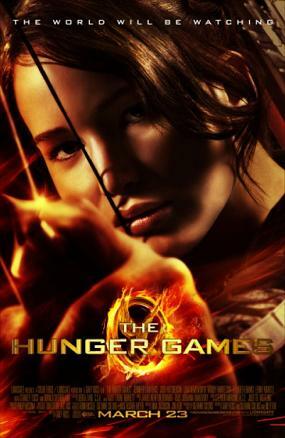 The film’s heroine du jour is 16-year-old Katniss (the excellent Jennifer Lawrence), who volunteers to take the place of her little sister in the games and finds herself pitted against allies she may ultimately have to kill, as well as enemies stronger, although not always smarter, than she is. It’s an interesting, if not unique, premise. The same goes for many of The Hunger Games other ideas in fact. From 1984 to The Truman Show to The Fifth Element to Battle Royale, there is nothing new here. Of course, that’s not to say The Hunger Games isn’t entertaining in its own right, because it is – after all everything from rom-coms to crime thrillers are often a reworking of the same old, winning formula. The Hunger Games stays close to its source material – not always an easy job with no voiceover to provide the clarity of the novel’s first person narration. On screen, information is revealed in gentle touchs, a nightmare, a fragmented memory, a TV insert, which explains just enough to keep you up-to-date. It also looks good. The Capitol’s wealth is suitably dazzling and the fashion, snigger inducing (of particular note is lead Gamekeeper Seneca’s beard), while the down-at-heel districts are pitiful in their earthy poverty, their silent heartbreak. The general lack of CGI is also refreshing, making this world and its people seem all too possible. On the downside, it is difficult to get into peoples’ heads – the tributes and their loved ones seem strangely subdued when their names are called, there is little discussion of the class system, little portrayal of how the tributes feel as they prepare to kill and be killed, in the name of entertainment. In fact, the other tributes barely get any screen time, presented merely as puppets to be killed off, with the result that their deaths lack impact. This may have helped garner that all important 12A rating but it’s when The Hunger Games is at its darkest, that it’s at its best – the Cornucopia “bloodbath”, a plate of berries, a young girl shaking as the seconds count down. The Hunger Games has been compared to Battle Royale and, it is easy to see why, with both movies pitting teenagers against one another. There is one major difference. For while The Hunger Games is a good film, well acted and certainly well worth seeing, it is forgettable. Battle Royale is not. I loved The Hunger Games. In terms of respecting the source material, I think it did a fantastic job. Battle Royale, on the other hand – loved the book, but the movie was just set up to fail. I know lots of people like it, but 2 hours isn’t nearly enough time to give proper attention to every character. It seemed so, so rushed, whereas The Hunger Games film didn’t. I should re-read Battle Royale though. Excellent concept and really well done!